Letters from Prison — Ginger writes. I have been writing letters to my friend Ian for the past six years. Ian is in prison for doing something so sad I can’t tell you what it is. TJ and I were in a small group with Ian and his wife Tara years ago in Illinois. Back then, no one could have imagined that this would be Ian’s story. I wish it was just a bad dream for all of us, and Ian could wake up to another beautiful day of freedom and sunshine. But instead he wakes up to a small room that he shares with his cellie, no breakfast (just brunch), and a day of more margin than anyone wishes for. I know details about prison life that I would never be privy to because Ian has learned that I have an affinity for minutiae. He tells me about the snack foods for sale at the commissary (“peanut butter in the jar, honey, cheese in bottles, sweet corn, black beans, Velveeta cheesy rice, Granny Goose popcorn, cinnamon grahams, doughnuts, danishes, oatmeal pies, Kit Kats, Hersheys, cashews, etc.”) and about giving his laundry bag and detergent to the porter on his wing on Fridays. I know he usually buys the Wisk packets, but they also sell Tide for $6. Ian talks about the two “day room” times each day and being allowed to take a shower and having yard for an hour and a half. He gets fried chicken on Thursdays and fish on Fridays, and sometimes gets mashed potatoes, rice and beans, or spaghetti. Desserts are "cookies, slice of danish, banana, apple, or sherbet.” He probably knew I was happy to hear about the fruit. Then there’s Lockdown and the “Orange Crush” looking for contraband. That was mostly in his old place before Ian was moved to a lower-security prison about a year ago. I've learned the layout of Ian's cell and how the top bunks are higher at the new place. No more bars now, either. His cell has a solid steel door and he so appreciates the privacy. Ian shares about getting a visit from his mother and from his friend Liz, and he talks about finally being allowed to sign up for his first college class, Business Communication. There is so much to take in, so much to learn. In my letters back, I talk about staying at home with the kids, and celebrating their birthdays at the end of every summer, and how Story loves Superheroes and how Sailor says so many words now. I talk about Bauer counting the words in Harry Potter just because he loves to count, and Cash longing for a dog to name Ranger. I describe my year of writing letters and talk about books I am reading or books I wish I was reading. I talk about meals we have for special occasions and ask him if there’s any special food prepared on Thanksgiving Day there. I tell him why we moved to SC and how the kids like school and where TJ has been for work lately. I want to know if other inmates get letters and whether he’s too hot or too cold. We go back and forth, asking, answering, writing, waiting. Ian occasionally requests a book about art or grammar or such, and we eagerly help, as books are one of the few things we can have sent to him. 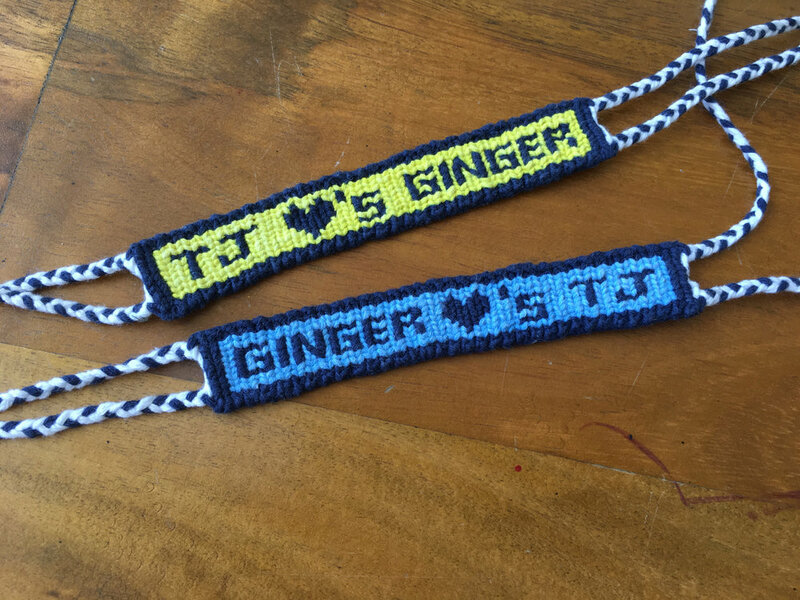 In return, Ian sends thanks you cards, drawings for the kids, three-dimensional paper roses, and most recently, these bracelets made of string. He makes birthday cards for each of us every year and it’s obvious they take time and talent. Ian shares what he has to share, but I am most thankful for his letters and words. If Ian had not done that bad thing, I feel 100% sure I would have lost touch with him. He and Tara would be in IL still and we would have moved on to life in SC. Those shared conversations in small group would be distant memories and my kids would not remember their kids at all. But Bauer, Cash, and Story all know about “Mr. Ian.” They ask why he’s in prison and I practice vagueness. They occasionally make cards to send to Ian, and they always enjoy the cards he sends them. 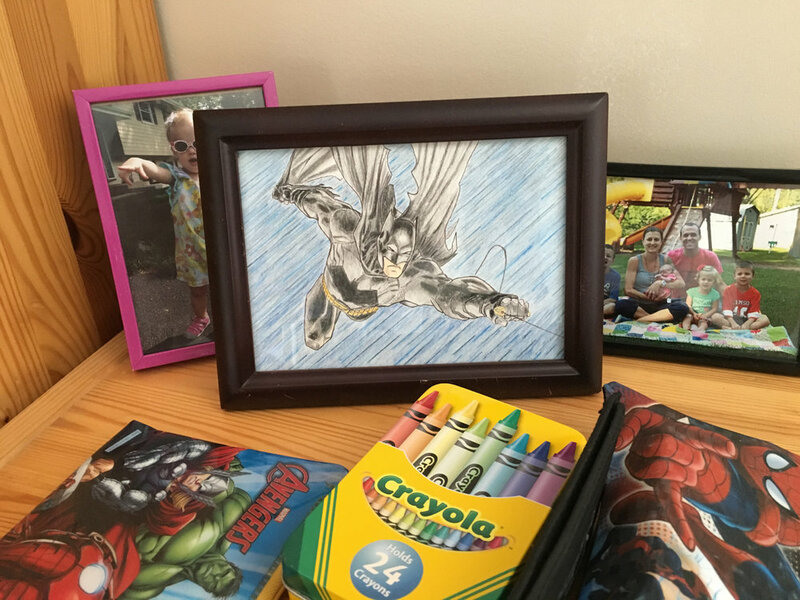 Story has her Batman card framed in her room. My life is different because I choose to write letters to Ian, just as his life is different because he has no choice but to write letters. He doesn’t have a glowing rectangle with which to communicate. He buys pens and paper and envelopes at the commissary and has only recently been able to obtain the use of a typewriter and cursive printwheel. I am thankful for Ian’s letters because they remind me every time not to take things for granted. I can eat what I want when I want and take showers at my own convenience. I can go inside or outside or back and forth all day long. My visits with my mom or with friends aren’t timed and we don’t have to stay in one little meeting room. When I see someone doing a job that I deem boring, like sitting at a mall kiosk, or driving an airport shuttle back and forth all day to the off-site car rental place, or sweeping up cigarette butts around a large outdoor venue, I immediately think of Ian and how he would probably love to do a job like that if it meant he could be free. And when I think of Ian, it helps me to embrace the mundaneness of my little life on the ordinary days, because I’ve been given the opportunity to see what life is like for someone who’d give anything just to do one of those boring jobs. And finally, because I get to see life at least a little bit through Ian’s filter, I find myself considering often that what Ian is experiencing in the small world of prison life compared to this big world on the outside, is like what we experience in our lives now compared to all that awaits us in the life to come. If only we could keep that eternal focus, we might spend our days differently and live to love. May God remind us, and may God help us. Ian will be out in 19 years and we already have it planned for him to come visit us at the lake. I’ll be 55 then and our kids will all be grown. I’m not in a rush to be 55, even though I wish greatly for Ian’s independence and can’t wait for that day of rejoicing with him. In the meantime, I have questions to answer, stories to share, prayers to pray, minutiae to enjoy, pictures to send, all for Ian, all because his letters from prison mean so much to me.